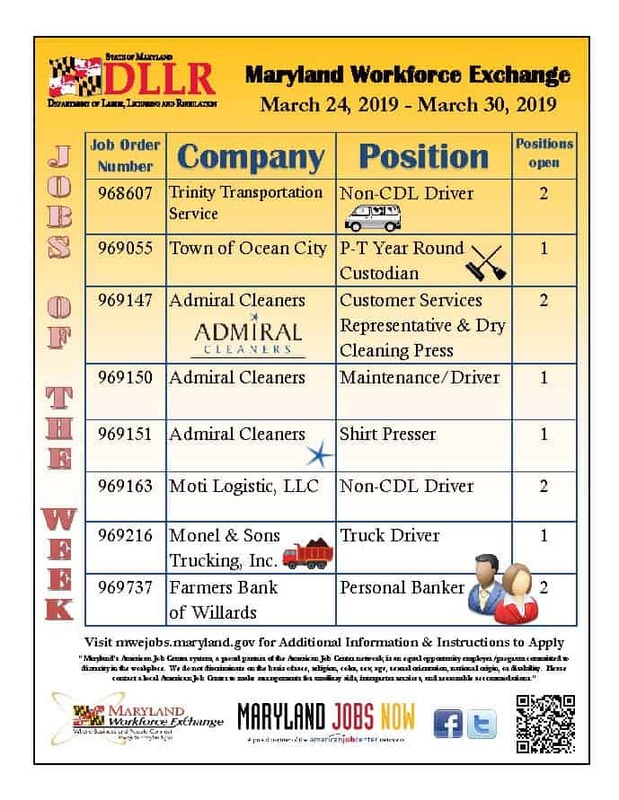 Take a look at the Maryland Workforce Exchange Jobs of the Week for March 24-30, 2019. These weekly updates are provided through our partner, the Department of Labor, Licensing and Regulation at 31901 Tri-County Way, Salisbury, MD. To contact DLLR, please take a look at our ‘Services‘ page for contact information. The Workforce Innovation and Opportunity Act (WIOA) provides for equal opportunity programs. It is the policy of the Lower Shore American Job Center that no person shall be subjected to discrimination on the grounds of race, color, gender, religion, national origin, sexual orientation, age, marital or parental status, or disability. Auxiliary aids and services are available upon request to individuals with disabilities. If you need special accommodations to receive services, please call 410-341-6515. Lower Shore American Job Center shared a post. Chick-fil-A Salisbury is looking to add driven and hardworking members to our team! We are having a special open interview session this Tuesday, April 23 from 2-4 pm. Full time and summer positions are available. The April 22, 2019 Job Journal is here! It is a weekly publication giving you tips, current job fairs and job listings, training services and opportunities, as well as education services and opportunities for Somerset, Wicomico and Worcester counties. It is a wealth of information! Lower Shore American Job Center shared a photo.